This is about evil robot usses, van dykes, and STATION! Click [HERE] to go to hell. That's at least one phrase the first film made popular (though I also liked "Something's afoot at the Circle K" personally). It's interesting you guys would tackle the sequel when you did. I suppose I was hoping the first film would be reviewed first but it sounds like Jeremy and his guys will be covering that someday, though I did see this sequel on the big screen (I was almost or already 14 at the time). While I heard you guys wished you had something of Gen-X status on to talk about this, I suppose I could fill in some details here. While it's true there's quite a lot of back-and-forth between the similarities of Wayne and Garth to Bill and Ted, I'm reminded of yet another movie that came out a few years before the first Bill & Ted flick that otherwise had a duo of slacker-type students in Carl Reiner's 1987 comedy "Summer School", named Chainsaw and Dave. Though hey were part of a group of underachieving students that needed to get a passing grade for the year, the two stuck out the most for having a similar mannerism to the other guys in the way they spoke and the way they liked certain things (girls and a particular interest in Tobe Hooper's "Texas Chainsaw Massacre"). This film outta be covered some day. Noticed someone who was a big fan of this film got to do a Q&A with some of the cast a few years back that's up on YouTube. But yeah, getting back on topic, I suppose it's hard to pinpoint who copied who since it was pretty experimental and either party probably didn't know the other half had the same idea for two slacker figures to be some prominent as they became. 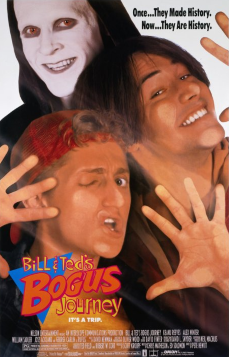 Of course it took some time before Wayne's World saw a movie after it's time on SNL and Bill & Ted had already spun off several TV projects before it's sequel came out. Still, both properties have made quite a cultural impact on equal terms with what each did to become familiar icons of what we thought of as the 'totally radical' for the time. While true some movies work well without needing to recap or remind us what happened before, the first film already did that with having the George Carlin character, Rufus, having to set up the premise of the first film with how he is tasked with trying to give our 'heroes" a little help while establishing what the world became in the future and how this boys affected it. We never actually see the future world as the sequel had, simply a closed off, metallic room where the time portal device (shaped like a phone booth) leaves and arrives through the stream of time or some nonsense. The sequel certainly expanded on this quite a bit with showing us the future world Rufus is from, let alone add in the clones who kill our heroes and send them to the other side. It is interesting the film takes on a darker tone as oppose to the first. Sometimes you have to do that in a sequel, be thankful they didn't drag this out into a third film though! I forgot this film had that bit during the end credits with them continuing to expand their popularity and influence. The first film gives us none of that, simply wrap the film up with the guys passing their oral report, getting the medieval babes they left behind earlier, and Rufus closes out the film with stating "They DO get better." as they play horribly. There, I spoiled the first film, sue me! A shout-out must be made to the comic book adaptation I've first read before watching this movie as penned by Evan Dorkin. After seeing the film, I felt Dorkin did a fine job fleshing out a world the movie barely scratched the surface on, not to say it wasn't equally as interesting, but he made it more enjoyable than I thought the movie could do budget-wise. There was also a follow-up comic series of 12 issues that pick up where "Bogus Journey" left off that Dorkin also worked on.